As a kid, did you love Saturday mornings? A big bowl of cereal and those favorite cartoons you waited all week to see. 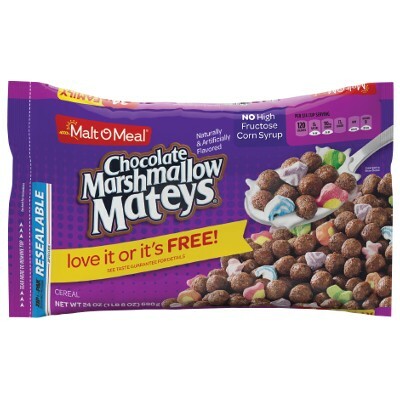 Relive those great memories with a big bowl of Malt O Meal Chocolate Marshmallow Mateys® This chocolatey good cereal with sweet bits of marshmallow is a real American treat. 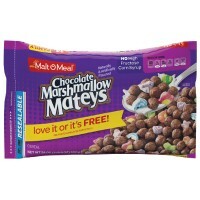 Every package of Chocolate Marshmallow Mateys® is loaded with 16oz of fun and fabulous flavor! Sugar, corn flour, whole grain oat flour (includes the oat bran), corn syrup, modified corn starch, cocoa processed with alkali, dextrose, coconut oil, canola oil, partially hydrogenated soybean oil, 2% or less of: salt, natural and artificial flavors, gelatin, colors E102*-E110*-E133-E129*, wheat starch, vitamins B1-B2-B3-B6-B9-B12-A-C-D, reduced iron, zinc oxide, color or mineral E170. *May have an adverse effect on activity and attention in children. Contains GMO. Nutrition facts (for 100g): calories 400Kcal, total fat 3.3g (saturated fat 1.7g), total carbohydrate 86.7g (sugar 53.3g), protein 3.3g, salt 0.9g.